Henriot Quimper creates beautiful pieces in all your favorite Quimper Decors, including Henriot, Mistral Blue, Soleil Yellow, Fleuri Royal, Campagne and many new innovative decors. Henriot's Dinnerware and Plates are a wonderful addition to your dinner table. The Serving Pieces are as lovely as decorations as they are useful. Redecorate your kitchen in Breton style with Quimper Faience Tiles and adorn your cabinets with truly unique Furniture Knobs. Enliven your living or bedroom with the Lamp Collection. Celebrate the holidays with the Christmas Collection, including ornaments and The Nativity. Celebrate a Baptism or Wedding or other religious event with the Religious Collection. Golf enthusiasts will love Henriot's Golf Plates & Accessories. 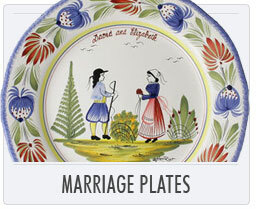 And celebrate a birth or marriage with the Personalized Baby Lug Bowls or Marriage Plates. And, now back by popular demand, Lady Clare's Quimper Placemats, Coasters, Tea Trays & Waste Paper Bins. The tin-glazed handpainted French faience known as Quimper Pottery, pronounced “cam-pair” has been manufactured in Quimper, a town in Brittany, France for over 300 years. The pottery adopted its name from the town of Quimper where potter Jean Baptiste Bousquet built his kilns in the Quimper area of Locmaria in 1685 and was given a royal manufacturing license by King Louis XIV. Although the area of Locmaria in Quimper has been associated with pottery as far back as the Gallo-Roman era, Bousquet is credited with being the founder of "Quimper Pottery". His firm was known as HB Quimper. In 1772, a rival firm was founded by Francoise Eloury known as Porquier. A third firm formed in 1778 by Guillaume Dumaine which was known as HR or Henriot Quimper. The pottery made by the three companies was similar featuring the Breton peasants and sea and flower motifs. Today, Henriot Quimper continues the tradition producing the traditional patterns featuring the Breton figures as well as many new more modern designs. The superbly talented resident artists at Henriot still hand-craft every piece of Quimper Pottery. Historically, the Quimper factories hosted artists in their studios which continues to this day. Quimper pieces are still produced from casts and works by major artists who have created works for the various Quimper factories, including Berthe Savigny, Louis Henri Nicot, R. Michaeu Vernez, Rene Quillivic, Beau & Porquier & George Robin. In addition, contemporary artists, such as Paul Moal and Loic Bodin continue to work with Henriot. 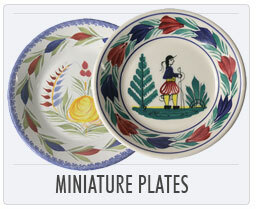 Each piece of Quimper faience is completely handmade and painstakingly hand-painted. Each piece of Quimper is unique. One artist handpaints each piece from start to finish. Each piece is then initialed by the artists and marked Henriot to ensure its authenticity. 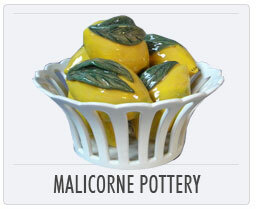 Order new Quimper French Faience Pottery items or replacement items for your damaged Quimper china. If you are don't see what you looking for, let us know. 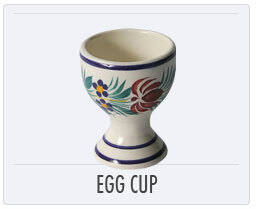 The Merchant of Prato, an authorized Henriot Faiencier distributor, keeps a large amount of IN STOCK Quimper items here in the US and we can order any item currently being made by Henriot Quimper in Quimper, France for you. Retailers: The Merchant of Prato is a wholesale distributor for the USA. 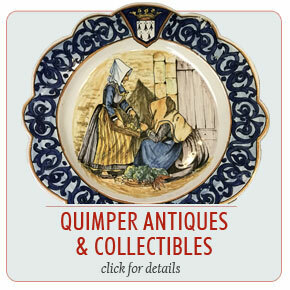 Click Here For Wholesale Quimper Information. Now carrying other wonderful products from France including La Rochere Glassware and Malicorne Pottery from Faïencerie d'Art de Malicorne. "I wanted to wish you a Happy New Year and thank you for the Quimper ware pieces through the Seasons. I love them."